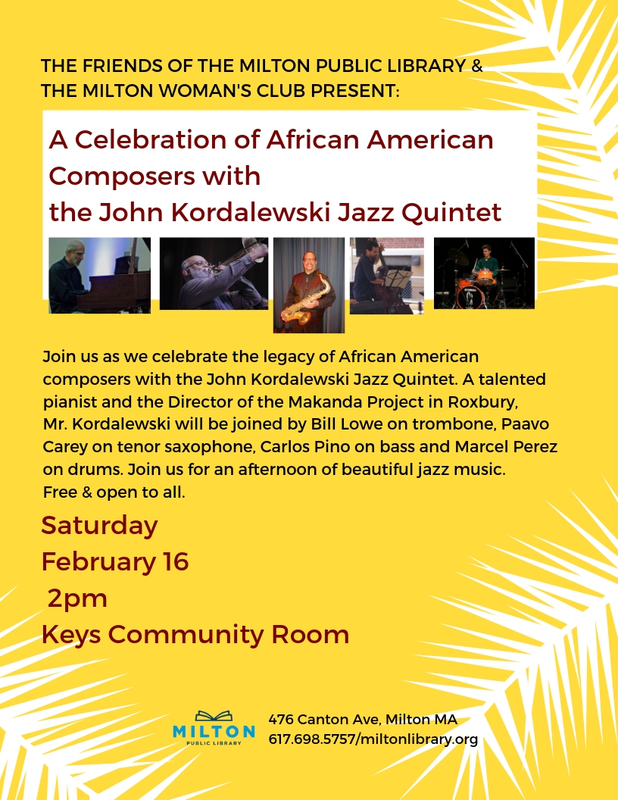 In honor of Black History Month, there will be a concert today called "A Celebration of African American Composers" by the John Kordalewski Jazz Quintet. A talented pianist and the Director of The Makanda Project in Roxbury, Mr. Kordalewski brings together some fabulous musicians for this program, including Bill Lowe on trombone, Paavo Carey on tenor saxophone, Carlos Pino on bass and Marcelo Perez on drums. This is a tribute to some incredible jazz players and composers, so please do not miss a very enjoyable afternoon of music at the Library. The group is a multi-generational mixture - veteran performers with vast experiences in the jazz world, along with some really talented up-and-coming musicians. We will sample the music of a group of jazz musicians who made their mark as composers as well as improvisers, some more well-known than others (Thelonious Monk, Tadd Dameron, Cedar Watson, Makanda Ken McIntyre, Bill Barron, John Stubblefield.) The event is kindly sponsored by The Friends of the Milton Public Library and the The Milton's Woman's Club, and it is free and open to the public. Join us!